If Die Hard had gone with one of its two alternate leads, or one of its two alternate plots, what would it have looked like? I can’t say enough good things about Die Hard. There were plenty of blockbuster movies before Die Hard (see Jaws; Star Wars). There were plenty of violent action movies before Die Hard (such as Predator or Commando). But Die Hard really invented the modern action thriller. The only comparable man-against-an-army stories prior to that were much slower by comparison – see Steve McQueen’s Bullitt or Clint Eastwood’s The Outlaw Josey Wales. Those were adventure dramas with a few action scenes sprinkled in. But Die Hard blended action and tension in a way that hadn’t been done before, and which everyone has tried to duplicate since. In hindsight, it looks like a perfect storm of movie magic. You have Bruce Willis, known primarily as a comic actor before this movie, as an eminently likable lone wolf cop. You have Alan Rickman, in his feature film debut, who all but invented the “snooty Eurotrash villain” archetype. You have John McTiernan, one of the greatest action movie directors of the 80s. A fantastic setting in the Fox Plaza, contributing Los Angeles glitz and the claustrophobia of a modern office. A great score. Fantastic pacing. Memorable dialogue. Thrilling setpieces. Really, an amazing work. You’d think it couldn’t have happened any other way. Except it very well could have. 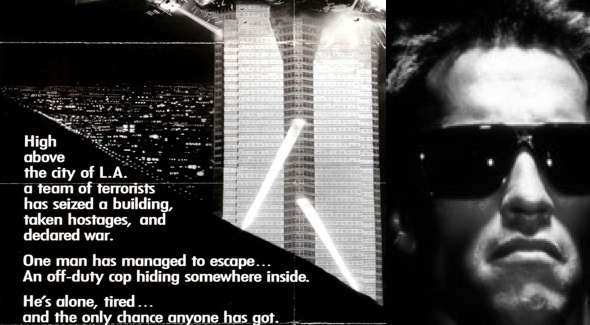 Die Hard was an adaptation of the Roderick Thorp novel Nothing Lasts Forever. This novel was a sequel to Thorp’s 1966 novel The Detective. The Detective, a gritty crime novel, was adapted into a 1968 movie of the same name starring Frank Sinatra. 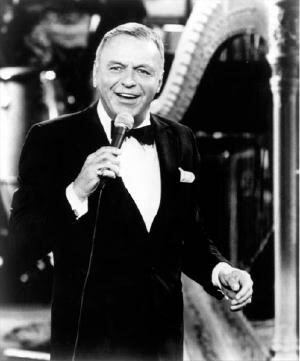 Thorp wrote Nothing Lasts Forever in 1979 with the intention of optioning it as a screenplay which Sinatra would star in. (This sort of thing is done all the time in that weird borderland between novels and movies – see Thomas Harris’s Hannibal, or Michael Crichton’s The Lost World). However, Sinatra wasn’t interested. The rights to Nothing Lasts Forever already having been acquired, the script was then shopped around as a sequel to Commando. However, Schwarzenegger declined to revisit the role. So the producers pitched the movie to a roster of action stars, including Harrison Ford and Sylvester Stallone. They all passed. Eventually, in 1987, it ended up on Bruce Willis’s plate. 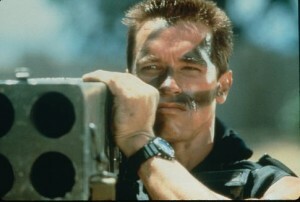 So: three possible movies – Nothing Lasts Forever, Commando 2 and Die Hard. Three possible stars: Frank Sinatra, Arnold Schwarzenegger and Bruce Willis. 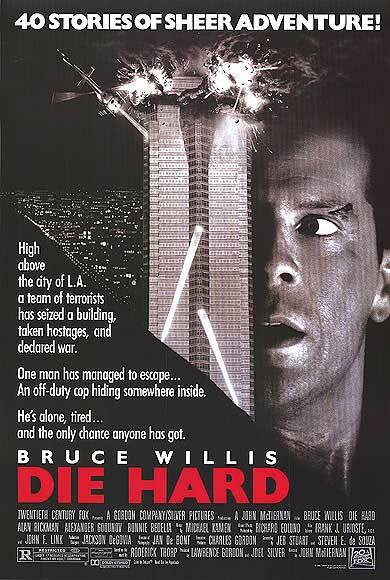 Only one of those movies ended up being made: the Die Hard we recognize, starring Bruce Willis. But what if we jump in our Overthinking It Time Machine – just back from the shop – and consider eight alternative histories? Also known as Die Hard0, or “Die Hard Prime,” this is the Die Hard we recognize from our reality. Detective John McClane retires from the NYPD after twenty-five years of service. His unit buys him a ticket out to LA to surprise his estranged daughter Holly in the hopes that they’ll reconcile. McClane begrudgingly takes the ticket. When Holly gets a phone call from him at LAX, stunned, she invites him to the Nakatomi Tower Christmas party. German mercenaries seize the Tower and take all the employees hostage. McClane gets scooped up in the proceedings. When he mouths off to a guard, he’s dragged off to get beaten. Of course, McClane turns the tables and lays a little chin music on the bozo, then hustles off. McClane’s escapades through Nakatomi Tower consist largely of running up and down stairwells. He wins the occasional shootout with a mercenary (their Steyr assault rifles vs. his .38 revolver) but largely relies on trickery and their own comic ineptness to win the day. After the police storm the office and Sgt. Al Powell (Sammy Davis Jr) shoots Hans Gruber, Holly collapses sobbing into McClane’s arms. “There, there, kiddo,” he says. Detective John McClane is suspended from the NYPD after blowing up half a city block in a drug bust. He loads up his motorcycle and rides west to see his kids and reconcile with his estranged wife Holly. Once in L.A., he cons his way past one security guard, then clubs another one on the head, to get into the Nakatomi Tower Christmas party. When German mercenaries seize the Tower, McClane fights them off for a while: breaking one merc’s neck, emptying a submachine gun into three others and throwing a massive art deco couch to crush two of them. But their superior firepower forces him to retreat, sprinting through the unfinished floors. He uses a circular saw to cut off one German’s arm, then uses it as a club to beat the others into unconsciousness. From there, the action never lets up. CB radio contact with Sgt. Al Powell helps him coordinate where the terrorists are. He stalks through the office building, stabbing, crushing and blowing away one German after another. The final shootout between McClane, Hans and Karl ranges across the Nakatomi corporate offices, an elevator shaft and the spotlit roof. Hans and McClane grapple on the helipad until Hans shoves McClane away and grabs a gun. But McClane holds up the second act MacGuffin – the detonator – as Hans wipes the blood out of his eyes. “It’s not bonds you should be worried about,” McClane says, “but BOMBS.” Hans looks down, sees the block of C-4 that McClane has shoved down his pants, and screams. The Nakatomi Corporation has funneled a massive volume of illegal campaign contributions to the California Governor’s race. When Nakatomi double-crossed the Governor, however, the Governor’s shadowy aide hired a team of German mercenaries to assault their office in the guise of a terrorist attack. While holding hostages, they would seize any records linking Nakatomi to the Governor. Frank Sinatra plays hard-nosed New York detective Joe Leland, visiting his estranged daughter Holly, VP of Development for Nakatomi in California. When the mercenaries attack at the Christmas party, Leland stays hidden, subverting their heist from within. After he captures terrorist lieutenant Karl and interrogates him using all the tricks of his NYPD career, Leland uncovers the conspiracy. He’s torn between escaping the building to get this news to the press and staying behind to save his daughter. The Nakatomi Corporation has been secretly controlling the California Governor’s office, through a combination of campaign contributions and violent intimidation. The Governor balks at Nakatomi’s demands to build a giant microprocessor plant in Orange County, knowing that it’ll just be a front for cocaine smugglers. Joseph Takagi (played by Jone Lone in this version) pretends to be mollified and promises to build the plant elsewhere. When the Governor is invited to the annual Christmas party at Nakatomi Tower, a team of German mercenaries invade and occupy the office. John McClane, who’s in Los Angeles to visit his estranged wife Holly, slips away in the chaos. When he captures terrorist mastermind Hans Gruber and beats a confession out of him, using all the tricks of his NYPD career, he learns the truth. The mercenaries were hired by Takagi as a feint in order to assassinate the Governor! McClane convinces Gruber that he can’t trust Takagi. Gruber sends his men to hold off the Nakatomi Security personnel who are on their way. McClane and Takagi get in a fight in the chairman’s office – Takagi with his father’s samurai sword from WW2, McClane with the aluminum bat from the Police Athletic League that he played in as a child. McClane wins, “calling his shot” a la Babe Ruth before knocking Takagi through a plate glass window. The Nakatomi Corporation has been secretly controlling the California Governor’s office by financing the Governor’s cocaine addiction. They’ve been working in league with Hans Gruber and his neo-Nazi army, rebuilding the Axis Powers to avenge their loss in World War Two. Their plan: to use Nakatomi Plaza as a staging point for an invasion of California. John McClane has recently retired from the NYPD to California to support his wife Holly in her career. He meets Holly’s boss, Joseph Takagi (John Lone), and their new German “industrialist” business partner, Hans Gruber (Jurgen Prochnow). While looking for the restroom at the Christmas party, he stumbles onto officers making plans for the California invasion. Overpowering the officers, he steals their assault rifles and flees the building, taking Holly with him. McClane and Holly spend the rest of the evening on the run, avoiding Nakatomi ninjas and Gruber’s neo-Nazi assassins. Holly hacks into Nakatomi files and discovers where the army is massing on the Los Angeles piers. McClane infiltrates this dockside compound to learn more, where he uncovers their ultimate plan: to seize control of the nuclear missile silos in the San Bernadino mountains and start a war with Russia! Now McClane must get to the silos, stop the Axis’s evil plan and rescue his wife – whom Gruber has taken hostage! Retired commando John Matrix visits Los Angeles to visit his estranged wife, Holly (Bedelia) and their daughter Jenny (Alyssa Milano). Jenny moved down the coast to live with her mother after being kidnapped by General Arius three years earlier (in Commando). Matrix keeps pressing for a reunion, but Holly thinks Matrix is too brutal to raise a child. Plus, she has her career to think about. German terrorists seize the Nakatomi Building, holding the employees hostage in exchange for the release of “comrades in arms” from around the world. Matrix stalks his way through the building, murdering terrorists with clever one-liners. For instance, he pushes a terrorist off a stairwell and says “Going down.” He slides a terrorist along a slick glass conference table and out a plate glass window and says “Meeting adjourned.” He impales a terrorist on the model of Nakatomi’s new Indonesian facility and says “You’ll never make it as a model.” And so forth. When he realizes that news anchor Richard Thornburg’s wife is among the hostages, he sneaks her out. In exchange, Thornburg goes on the air and announces that the prisoners that Gruber wants released are being freed. Gruber orders the release of the remaining hostages, giving Matrix a clear shot at the terrorist stronghold. In a climactic battle, Matrix clubs Gruber over the head with a plank from a wooden conference table (“You’re chairman … of the BOARD!”) and knocks him out a window. It’s one of those sequels like Predator 2 or The Substitute 2, where the situation is similar but the characters are different. Bruce Willis plays John McClane, a Special Forces commando who (as the movie opens) helps a band of mujahdeen freedom fighters blow up a Soviet tank battalion. This once again puts him at odds with Genry Grubenov (Alex Rickman), Spetznatz officer and expert assassin. One year later, when McClane is at his wife Holly’s Christmas party, Grubenov and his commando team occupy the building and hold everyone hostage. McClane slips away in the confusion. He stalks through the skyscraper, blowing up terrorists and uttering the occasional witty one-liner. For instance, McClane chokes a terrorist with a fire hose, then starts the water, constricting the hose around the terrorist’s neck until his head pops off (“Where’s Karl?” “He had to pop off”). Once McClane gets to the utility room in the basement, he taps into the phone lines and places a call to his commando buddies, who join him in laying siege to the skyscraper. Why doesn’t he call the cops? Because “this is our fight, Grubenov,” as he says while chasing him around the unfinished thirtieth floor with a shotgun. “This is personal.” And then he blows him out a plate glass window. Frank Sinatra replaces James Olson as Maj. General Franklin Kirby, commander of John Matrix’s special commando force from the first movie. When he goes to visit his daughter Holly in Los Angeles, he’s caught up in a hostage crisis at Nakatomi Tower. German terrorists have taken over the skyscraper, holding the office Christmas party hostage to demand the release of their comrades. Kirby escapes, using his old commando training, and sneaks for the exit. While he’s overpowering guards and hobbling down stairs, however, terrorist mastermind Hans Gruber discovers who he is – and that his daughter Holly is in attendance. 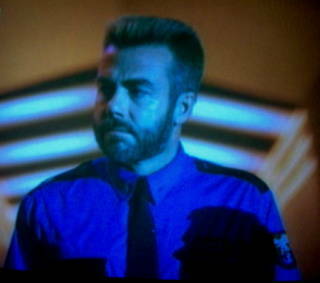 Gruber demands that Kirby return to the 40th floor and recruit his former commando unit to help the terrorists escape. Kirby puts out the call and 80s action bit player Sven-Ole Thorsson shows up as an unnamed commando (who’s clearly supposed to be a stand-in for Schwarzenegger). Once he’s let into the building, he and Kirby exchange secret hand signs, overpower their captors and blow the rest of the terrorists away. So there you have it, Overthinkers! I still believe that we got the best of all possible Die Hards. But what say you? The clincher for me with Die Hard was that, unlike all the previous action-hero movies, everything that McClane did was believable, with the exception of the jump across the air shaft and getting into the access hatch. I was willing to give them that one but in “real life” he would probably have missed or slipped, his fingers sliding on the shiny aluminium, and off to the bottom he goes. That’s not a movie! Alan Rickman was the other glory. If only Severus Snape chewed scenery with such relish! Learning about these other casting choices is always fun for speculation and I was not aware that Arnie, Sly, or Harry Ford were ever considerations. If it truly was a sequel to Commando – would Hans Grueber have to dress like David Bowie much like Bennet dressed like Freddie Mercury? Honestly – love the article! In a bit of serendipity, wasn’t Die Hard III: Die Hard with A Vengeance originally going to be a random Bruce Willis movie entitled ‘Simon Says’ but when they realized how close his character and back story matched John McClain they were like – “hellz yeah, sequel money peoples!” (Isn’t that how Hollywood execs talk?). Which was after it was going to be Lethal Weapon movie. Alan Rickman (Hans Gruber) would have to dress like Klaus Kinski. But if it were truly a sequel to Schwarzenegger’s COMMANDO, Matrix wouldn’t be visiting his ex-wife as she’d died somewhere in the backstory to the first film (see the Director’s Cut). More likely, he’d be on vacation visiting Rae Chong’s character or his daughter at her new internship job. And in keeping with the spirit of the original (which you’ve done a fine job in the one-liner department), Matrix would be fighting hordes of enemies on each subsequent floor.